What kind of influence did Queen Victoria have not only in her time, but on today's wedding traditions, and on some of the antique engagement rings still available today? Her legacy lives on in Victorian era splendor. Only the most renowned monarchs have entire eras named after them, and Queen Victoria certainly fits the bill. She was crowned Queen of England in 1837, at the age of 18, and remained on the throne until her death in 1901, just four months before she would have celebrated her 64th year as Queen. She was the longest-reigning monarch in British history until September 9, 2015, when Her Majesty Queen Elizabeth II (Victoria's great-great-granddaughter) surpassed her. But it's much more than Victoria's longevity that called for a namesake era, and the traditions that came with it. Queen Victoria exerted tremendous and long-lasting influence on many facets of life, particularly wedding etiquette. It may surprise you to learn that several of today's nuptial traditions originated with Victoria, from the white wedding gown, to white wedding flowers. Queen Victoria was a trendsetter like no other. You may be thinking Victoria's engagement ring must have been a whopper of a diamond, a jewel only a queen could carry off. In fact, the ring Victoria's beloved Prince Albert gave to her was a gold serpent with an emerald-set head, certainly one of the most unusual engagement rings ever-let alone royal engagement rings-which are usually much more traditional and yes, ostentatious. However, this particular engagement ring did bear out tradition. In many cultures, the snake is a symbol of eternity, particularly when displayed eating its own tail (an Ouroboros), and the emerald was Victoria's birthstone. It was actually quite a thoughtful gift on Albert's part, an expression of his deep love and affection for Victoria. As a result of this gift, and because of the influence royals had-and continue to have-on fashion and trends, snake-themed jewelry became quite popular with women of the Victorian era. 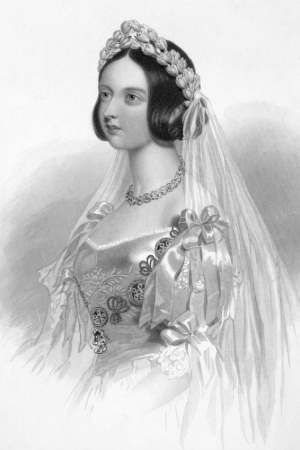 Victoria's emerald-adorned engagement ring was less-than-unusual for another reason-diamonds were scarce, and usually small. 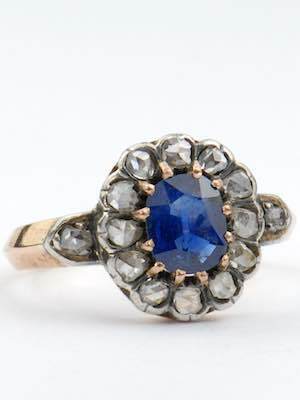 For these reasons, it's less common to see them as the center stone in Victorian engagement rings. In 1867, the first diamond was discovered in South Africa, and diamond mines opened there, and became productive around 1870. This is why many engagement rings during that time featured colored gemstones such as emeralds, rubies, and sapphires. Engagement rings from this era also sometimes feature a circle of small diamonds surrounding a colored gemstone, creating the "halo" design that is still popular today. It's also sometimes difficult to find pearl-adorned Victorian engagement rings, as they were considered to be "tears of the bride." Pearl engagement rings did come into favor in later years, though. Another common feature of Victorian-era jewelry is filigree. Actually, filigree was popular not only in jewelry, but in Victorian architecture, and even typography. As a jewelry facet, filigree dates back more than 5,000 years, so it's common to find older engagement rings adorned with intricate filigree designs. With so many royal and historical influences, Victorian engagement rings offer a wide variety of designs, colors, and features, giving today's bride the opportunity to choose a ring that suits her personality, and is truly unique among a sea of diamond solitaires. Shop our hand-picked collection of beautiful antique engagement rings to find the one that fits your unique personality.